Below you will find links to external websites that we hope will be of interest to visitors to this site. The South Eastern & Chatham Railway Society is not responsible for content found on these sites. If you would like us to add a link to your website please use the Contact Us page. UK's first preserved standard gauge passenger railway located in Sussex. The Bluebell Railway is the home of the largest amount of preserved SECR locomotives and rolling stock. An up and coming heritage railway deep in the Kent countryside. It was originally built to serve the Kent collieries and today is run entirely by volunteers. Said to be the country's finest example of a rural light railway. Home to SECR P Class Locomotive, SECR Carriages, Cavell Van & Wagons. Formed in 1974 with the aim of collecting and publishing information on the London, Brighton and South Coast Railway Company and its constituents. The object of the group is to promote interest in the railways of southern England, in particular the Southern Railway, its pre-grouping constituents and post-nationalisation successors. Formed in 1962, is a society for railway historians and enthusiasts interested in the London & South Western Railway (LSWR). Formed in 1984, the Society caters for enthusiasts of the highly charismatic railways engineered and/or managed by Colonel Holman Fred Stephens. UK based non-profit organisation for enthusiasts, historians, modellers and preservationists of the largest third rail electric railway system in the world. A group formed for discussion by email over the Internet between Railway Enthusiasts, Historians and Modellers interested in the Southern Railway. Huge website of information. A group with a passion for the collection and preservation of all printed railway material. Previous publications a handbook on SER & SE&CR Luggage Labels. Founded in 1950 by historians and modellers to collect and exchange records, drawings and photographs in the interests of accurate modelling. Large SECR archive. A Society established for over sixty years. Catering for a wide variety of railway related modelling interests and capabilities. A website from Terry Tracey showcasing his excellent Allhallows layout in 3 mm scale with many SECR Loco’s in BR livery as they would have looked in 1950’s & 60’s. Bachmann a huge range of Ready to Run models, of which there are a number of locomotives and buildings suitable for those modelling the SECR. Hornby is Britain's longest running manufacturer of model railways. Their range will soon feature a OO gauge Terrier in SECR livery. Dan Garrett’s well researched 7mm locomotive, wagon & carriage kits, etches & castings. 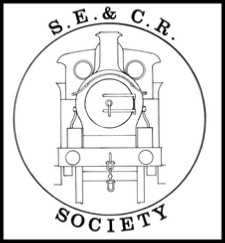 For 19th Century railways generally and particularly the SER, SE&CR, LBSCR, EKR and SR.
An excellent website containing a large amount of images and information on closed passenger & goods stations. With information on closed SECR stations & lines. The National Railway Museum in York & Shildon is the home to over 300 years of history and over a million wonderful objects. Including many SECR items & Class D Locomotive. David Glasspool’s site covering the history of Kent railways from the first rails laid in Swanscombe onwards. Stations and motive power are looked at in detail with many photographs. The Guild of Railway Artists provides a tangible link between artists depicting the heritage and the modern practices of the railway scene in its many facets.